Open to all ages / *Booking Fee's apply / Subject to availability / All sales are final we do not offer refunds. / WE CAN NOT ADMIT PEOPLE OUTSIDE OF THEIR ARRIVAL TIMES DUE TO STRICT FIRE REGULATIONS. Let there be Cheese! Cheese Fest lands in Liverpool for the second year!! 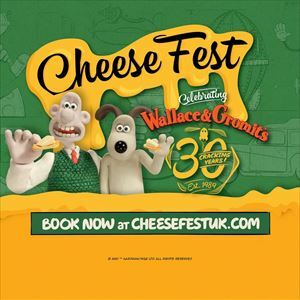 CheeseFest promises to be a grand day out for all the family with a jam packed programme of feasting and entertainment hosted by the world’s most famous cheese ambassadors Wallace & Gromit. Kids can enjoy model making, life-size vehicles, film screenings of popular Wallace & Gromit movies, and a meet & greet with Wallace and Gromit themselves. Young and old, all are welcome, so don’t be sheepish! – get involved! HELP US REDUCE QUEUE TIMES! PLEASE SELECT YOUR ARRIVAL SLOT CAREFULLY! Once inside CheeseFest you can stay as long as you wish.